Cranberry Mint Mojita Mocktail – What's for dinner, Doc? CSA's, Healthy Living, Mocktail, What's in the box? 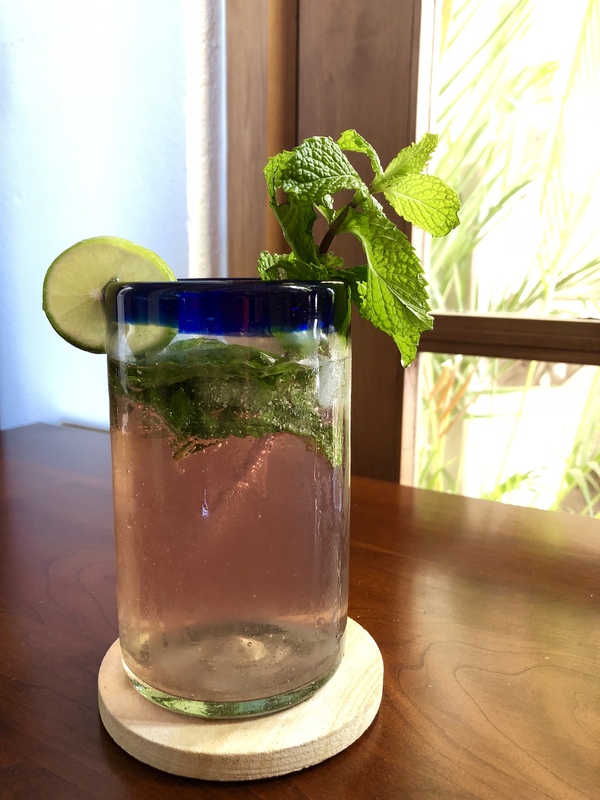 I’m celebrating the start of the Loreto Bay CSA with a refreshing mocktail made with fresh mint from my basket of greens, asparagus, cherry tomatoes, lettuce, Swiss chard and bunches of fresh herbs. Whether you chose to live as a sober rebel or not, it’s always nice to offer an alcohol free “mocktail” to your guests. My CSA basket had a nice assortment of herbs including basil, thyme, mint, sage and parsley. All of these herbs can be used to make spicy mocktails. Add simple syrup, agave syrup, juice, muddled herbs, a squeeze of lime or lemon and a splash of sparkling water like Topo Chico. These refreshing mocktails will rival any fancy cocktail with style and less calories. Carefully wash 6 fresh mint leaves and add 1/2 cup of sweetened cranberry juice, I prefer cranberry juice made with real sugar. 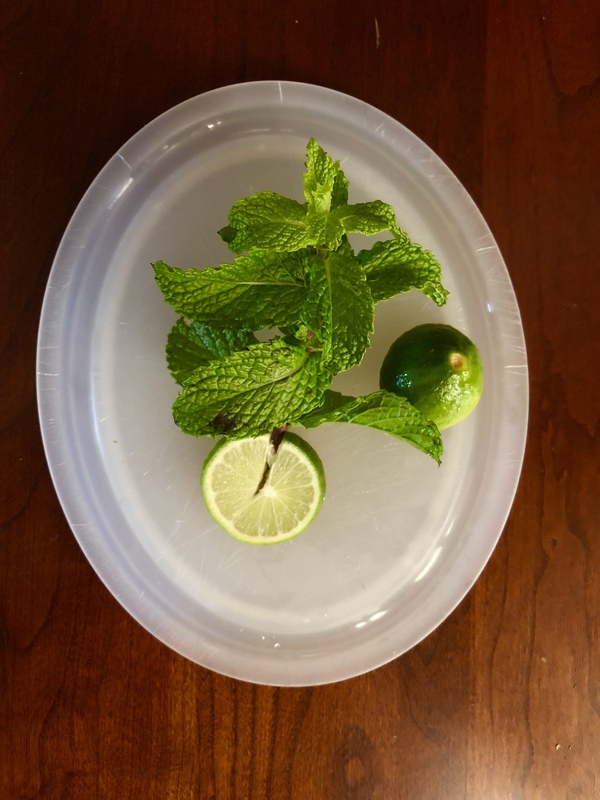 Muddle the mint leaves with a wooden spoon handle. Add juice of 1 key lime or 1/2 Persian lime, ice and top with sparkling water. If it isn’t sweet enough add agave syrup or simple syrup to taste. Serve with a lime slice and a sprig of fresh mint. Heat 1 cup of water with 1 cup of sugar on medium heat until the sugar dissolves. Allow to cool and store covered in a glass container in the refrigerator. It should last for a few weeks. I’ve added ginger root, basil, mint, lime zest, orange zest and thyme to simple syrups to make a variety of cocktails and mocktails. Add the extra ingredients to the hot syrup and muddle the leaves. Let sit until cooled and strain away any solids. Simple syrups are inexpensive to make and have no artificial ingredients. They will last up to 7 days in the refrigerator. Cheers to the start of the Loreto Bay CSA and to a healthy refreshing drink on a sunny Baja day. this looks delicious! especially love the fresh mint! Thanks for stopping by, I always have fresh mint and Mexican limes in mi casa.